In a bi-partisan effort, Nassau County Preceding Officer Norma Gonsalves helped secure funding for Nassau County’s Clean and Seed Program. With the funding, Nassau County will be able to help nearly 14,000 households who had their property destroyed by sewage and other pollutants during Superstorm Sandy. 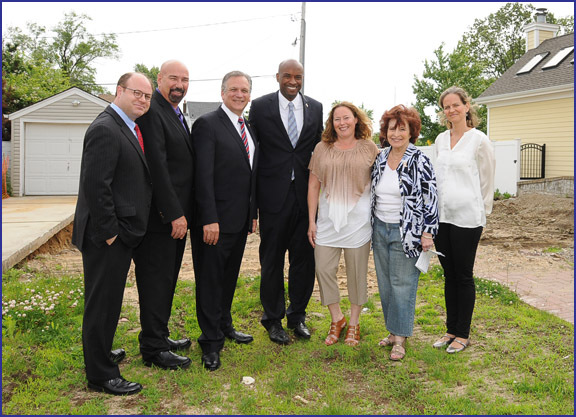 Pictured: Avi Fertig, representing Town of Hempstead Councilman Anthony Santino, East Rockaway Mayor Francis Lenahan, County Executive Edward P. Mangano, Minority Leader Kevan Abrahams, Village of East Rockaway Trustee Theresa Gaffney, Presiding Officer Gonsalves, and Legislator Laura Curran.